I don't think this has been mentioned yet.. The rom works on the Wii ColecoVision emulator (WiiColEm) beautifully. Using the second player Wiimote by pressing the "+" you can access the second player virtual ColecoVision controller and enter the code for PacMan Plus as well. I'll fire that up really soon. I just wanted to report that this game launches in colecovision on Raspberry Pi 2 (Retropie) I'm thrilled about that! Buttons that work (corded xbox controller). The left analog works to move the arrow up and down on the menu. The "A" button on a corded xbox controller works to select a game. However, from there I could not start the game no matter what buttons I pressed. I also tried pressing every button on my keyboard. Has anyone had luck getting a controller/keyboard working for this game on Retropie? The game seems to be playing at full speed. I also cannot exit the game once inside with the usual (start+select). Edited by KAZ, Tue Feb 9, 2016 7:45 AM. You need to "insert coin" to start the game which is # on the keypad. I'm not sure what controller you are using, but I use either a PSX or SNES type controller. I'll attach my CoolCV mapping file so you can give it a try. It goes in your /home/pi/ folder. Start+Select works on my mapping to exit the emulator. Thanks a ton! I have both psx and snes controllers I will try with your mappings. The controller I tried was a corded xbox 360. Edited by KAZ, Tue Feb 9, 2016 8:58 PM. I used a usb controller from Tomee (shaped like an snes controller). It started the game well. Played fine. What controller do you use, TPR? What brand of snes usb controller or do you use an adapter? I also tried using a real snes controller hooked into a usb converter, but the retropie would not recognize it. Retropie is fun to tinker with. It plays PSX games very very well also. I want to get both of the controllers you have. Do you have a picture/link/info about your snes USB controller? I have many controllers, but I want to get the exact ones you have to match your txt file. Edit: I just ordered a Tomee Playstation 3 controller. I assume this is the one you got? Edited by KAZ, Thu Feb 11, 2016 6:23 AM. The original unreleased 1983 Atarisoft Pacman for the ColecoVision/ADAM has a 16KB uncompressed ROM size (11KB compressed ROM size). 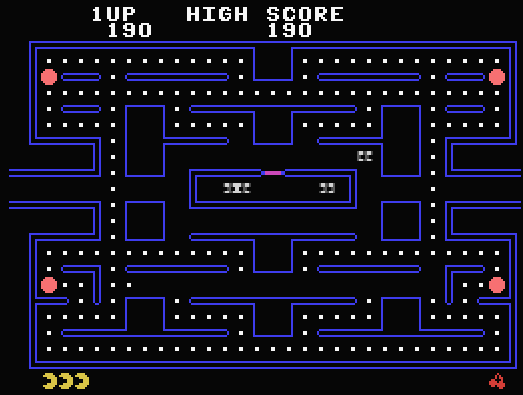 The Atarisoft Pacman has excellent picture, sound, and game play. In addition, the ghosts do not flicker on the Atarisoft version. If Atarisoft would have released this game back in 1983 they might have been able to sale a million copies of the cartridge and maybe 200,000+ more people would have purchased a ColecoVision or ADAM computer. Opcode’s Pacman Collection for the ColecoVision/ADAM has a 128KB uncompressed ROM size (48KB compressed ROM size). I finally got around to playing OPCODE’s Pacman Collection for the very first time. The game is outstanding and OPCODE clearly is the best or one of the best third party videogame developers for the ColecoVision/ADAM. When Opcode’s Pacman Collection is compared to the original arcade Pacman and Ms. Pacman games, the arcade version is only slightly better. Some people unless they have a chance to play the original arcade version and Opcodes version side by side will not be able to tell the difference since Opcodes version is almost perfect. For some reason the ghosts flicker a little bit in Opcodes version, however that most likely is a hardware limitation with the ColecoVision hardware or graphics chip limitation. Perhaps if the Supergame module extra ram and sound chip was used, maybe a better version of Pacman Collection could be created. I was just amazed with the Opcode Pacman Collection game quality (Now if we could get Junior Pacman that would be great). I can see why people are patiently waiting for Opcode to release a Donkey Kong that in theory will be better than the official ADAM Donkey Kong the Supergame. If OPCODE's Pacman Collection game would have existed back in 1983, 1 million more ColecoVision game systems would have been sold. Many people wanted Ms Pacman for the ColecoVision and now they finally have it thanks to Opcode games. Edited by HDTV1080P, Tue Aug 8, 2017 11:24 AM. For some reason the ghosts flicker a little bit in Opcodes version, however that most likely is a hardware limitation with the ColecoVision hardware or graphics chip limitation. The original unreleased 1983 Atarisoft Pacman for the ColecoVision/ADAM has a 16KB uncompressed ROM size (11KB compressed ROM size). The Atarisoft Pacman has excellent picture, sound, and game play. In addition, the ghosts do not flicker on the Atarisoft version. The ghosts are two colours each, so how did they do it without flicker? Edited by mr_me, Sat Aug 26, 2017 8:24 AM. I went ahead and figured out how to disable sprites in BlueMSX, which was Lshift, LCntl, and S.
Turns out Atarisoft was using background layer for eyes, with the sprites on top. Indeed, it is a very smart solution. I have always been impressed by the developpers from AtariSoft.